HTML5 and CSS3 have started conquering the web. They both combine to produce great functions and effects and really make our eyes wide opened. For example, have a look at this Windows 7 start menu designed using only CSS3! 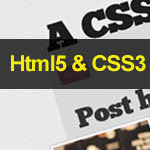 Nowadays, there are a lot of tutorials and resources on HTML 5 and CSS3 including the cheat sheets which are very essential to web developers and designers who are willing to code using these standards. I’ve managed to search and listed out the available cheat sheets. Nice post bro.. CSS3 is new generation for design web (except for IE) hehehehe..
New blogger default templates are using this CSS3. So, we should also start designing templates with CSS3 effects in our templates to make sure we are not defeated by them.